Seven years ago, the Atargatis set off on a voyage to the Mariana Trench to film a “mockumentary” bringing to life ancient sea creatures of legend. It was lost at sea with all hands. Some have called it a hoax; others have called it a maritime tragedy. Now, a new crew has been assembled. But this time they’re not out to entertain. Some seek to validate their life’s work. Some seek the greatest hunt of all. Some seek the truth. But for the ambitious young scientist Victoria Stewart this is a voyage to uncover the fate of the sister she lost. This review will come in two parts. First up, the general ‘what did Dave think of the book’ bit, then a SPOILERIFIC (real word, honest) bit. 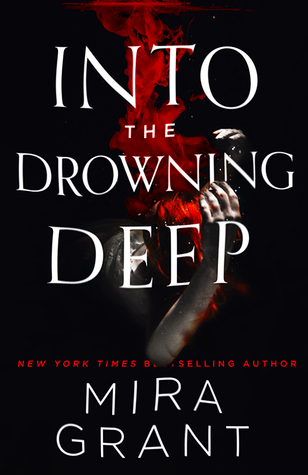 I was torn when it came to giving Into The Drowning Deep a star rating on Goodreads. It’s a solid thriller, and I polished it off in a couple of days. Perfectly decent, if unsurprising alien horror. Reminded me a little (ok, a lot) early Michael Crichton books. But… just wasn’t really scary enough for me. Not quite a four-star ‘loved it’, but more than a three star. Ok, let’s go 3.5 stars. If you like Michael Crichton’s ‘something scary going on, lots of science and OMG IT’S EATING MY FACE’ then I have no hesitation in recommending this book. You’ll almost certainly enjoy it (especially the face-eating bits). The story moves along nicely, the scary monsters are certainly monstery and it’s worth your time if you’re into that sort of thing. I did enjoy it. See, the trouble I had with this book is that I’ve seen it before. Strange things going on so a bunch of people go investigate and get their faces eaten. No, they’re not dinosaurs, they’re mermaids. With lots of teeth. But you’ve got the usual cast of characters who naturally, make a series of spectacularly stupid decisions, usually resulting in them getting their faces eaten off. There’s the Company Man (and the company is called Imagine. Not at ALL like InGen. No sir. No dinosaurs here) with An Agenda. His estranged genius sort-of-ex-wife scientist. The cute younger scientist who lost her sister to a previous mission. There’s a tricked-out super science ship with non-working shutters (of course). There’s pretty much a bit where someone has to go down a darkened corridor to do A Thing and gets their face eaten afterwards. The husband-wife hired killers who liked hunting things but continued to make a series of stupid decisions throughout the story. The company who sends a partially-working ship to find killer mermaids but can’t be arsed to wait to sort the shutters out because waiting another few days to set off wouldn’t kill you (but mermaids with a face-eating thing will). Some bits did surprise me – Theo Blackwell’s gammy leg due to an unspecified-yet-teased injury which required regular injections of an oddly-specific concoction of snake venom mixed with other things, which I assumed would come up later – either he’s getting eaten because he can’t run because of the leg, or someone discovers that the oddly-specific drug concoction would turn out to the THE MAGIC THING that killed off the mermaids. Weirdly none of this happened and it turned out that he just had a bad leg and needed to inject himself regularly. Oh. AND! the bit where Tory falls into the ocean with all the until-now-killer mermaids, who’ve pretty much eaten the faces off EVERYONE but now largely ignore her (??). And has to swim under the ship due to the now-working shutters and swim through a tiny hatch only to be stopped at the end and appear to be drowning BUT NO, someone spots her behind the clear plastic (??) shutter which can only be opened from the inside manually (I dunno, maybe the electrics were still fried despite the cameras working) and requires someone to risk life and limb (and face) to go into the pool with the mermaids (who have got bored of eating faces) to open it and save the day. HOWEVER. Despite all that, I did enjoy it. It was daft and silly but rattled along – I liked the characters (mostly), it was an interesting setting, and left things open enough for a sequel. Which I’ll probably read. Like I said before, if you like Crichton, you’ll more than likely like this. Huge thanks to Nazia @gambit589 for the review copy.